The sign outside of El Arroyo restaurant on 5th Street is an Austin icon. For decades the sign is a source of daily humor or information for the thousands of drivers who move past it heading downtown. 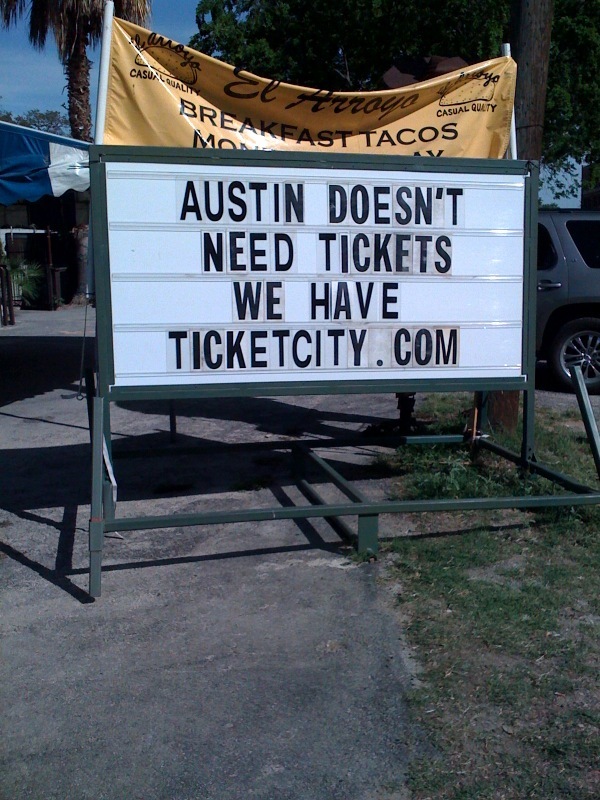 Saturday was a notable occasion for TicketCity, as we were featured on the sign. Quite an honor for us. Thanks El Arroyo! TicketCity was featured on the famous El Arroyo sign on Saturday, April 4th. Thousands of drivers saw the sign while heading down 5th Street towards downtown Austin. Info on El Arroyo sign. Link to El Arroyo restaurant.